Through a series of exhibitions, panels and workshops, the gathering will be held on 12-15 January to explore the theme of Art in the Time of Crisis. In its second year, the gathering seeks to provide a platform to connect countless diverse artists from all over the globe. Congregating in the sacred city of Fez, the gathering will be filled with discussions, exhibitions and workshops that are open for everyone to take part in. They will discuss very pertinent issues that permeate various parts of the world today. “We want to give these major issues a different perspective and open up the dialogue,” Chennafi said. The guest of honor at this event is no other than the European country, which has accepted the largest number of refugees, Germany. Not only is the country a pivotal cultural and artistic hub in the European continent, at the time of this crisis, it is using its economic might and strong political position to welcome and integrate refugees into its society. The 2017 Gathering will host five new art exhibitions, selected by German curators Pascual Jordan, and Evi Blink, that will blend together through photography, installations and paintings. The artwork covers a broad range of topics, such as the refugee crisis, war, Islamic extremism and a lack of global education. Exhibited artists will come from all corners of the globe. 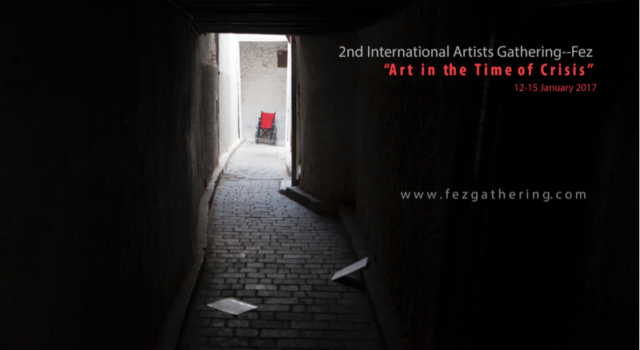 The gathering also aims to promote art education amongst Moroccans, as all events are free and open to the general public. 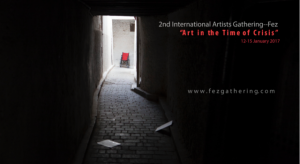 In doing this, the event is accessible to all, artists and non-artists, Moroccans and foreigners; its doors are open to all those who wish to discover more about art and its role in crises. The gathering further seeks to promote artistic expression and its role in combatting extremism. Morocco is a world leader in combatting Islamic extremism and it is via the promotion of cultural initiatives such as the International Artist Gathering in Fez that this can be achieved. “Muslim culture celebrates art, but it isn‘t given the right exposure. We are trying to open up this conversation globally to show the world that there is a place for art in Islam. Religion without culture is extremism and culture without art is dogma and art is the opposite of dogma,” Chennafi added. Upon its conclusion the gathering will be reviewed and participants will be able to give their feedback on the event. The entire festival will be filmed, documented and subsequently shared on social media. Coverage will also include one-on-one interviews with artists and participants. “We want to archive everything that happens, so that anyone who has an interest in cultural research can have access, ” Chennafi said.